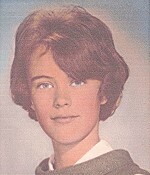 The 1968 unsolved homicide of Joanne Dunham. On June 11, 1968 at approximately 7:10 a.m., Joanne Dunham, age 15, was last seen while walking from her home at Raiche Mobile Homes in Charlestown, NH enroute to her bus stop on her way to school. She never got on the bus. Her body was found at approximately 4:15 p.m. the following day on a roped off dirt road on Quaker City Road in Unity NH approximately 5½ miles from where she was abducted. An autopsy determined that Joanne died of asphyxiation.